Dorothy Pinkney points to where her husband, Rev. Edward Pinkney, is jailed as Maureen Taylor and Marian Kramer of the Michigan Welfare Rights Organization look on during a demonstration outside the Berrien County Jail. I want to personally thank the Bay View for the many articles you have published in reference to my husband, Rev. Edward Pinkney, who is truly a man of God and who has made the supreme sacrifice, not for himself, but for the people. We share the Bay View with many residents in Benton Harbor. Once again, we need your help to get the word out. What makes my husband’s fight so courageous is the Goliath he faces. Whirlpool, the world’s largest producer of home appliances and the economic force here in Benton Harbor, is a pioneer in designing new ways to rip off the poor. Jean Klock Beach Park, located on the shore of Lake Michigan, was left to the residents of Benton Harbor, Michigan, which is 96 percent Black. Whirlpool is attempting to steal all the beautiful lakefront valuable land in the city for a whites-only $1 billion project called Harbor Shores. This project does not include Blacks. My husband, being the man he is, chose to fight this manipulation at whatever cost or level he could. There is no documented evidence of the KKK in St. Joseph, Michigan, where most of the judges and prosecutors live, but it is a fact that the KKK is there, right across the river from Benton Harbor, a city that is almost entirely populated by Black people. Looking at the perfect, sterile beauty of St. Joseph and the boarded-up broken promises of Benton Harbor, it’s hard not to wonder what force keeps them separated. If you consider some out of place actions by the government, such as overturning a legitimate recall election, firing a competent city clerk and jailing my husband, the Rev. 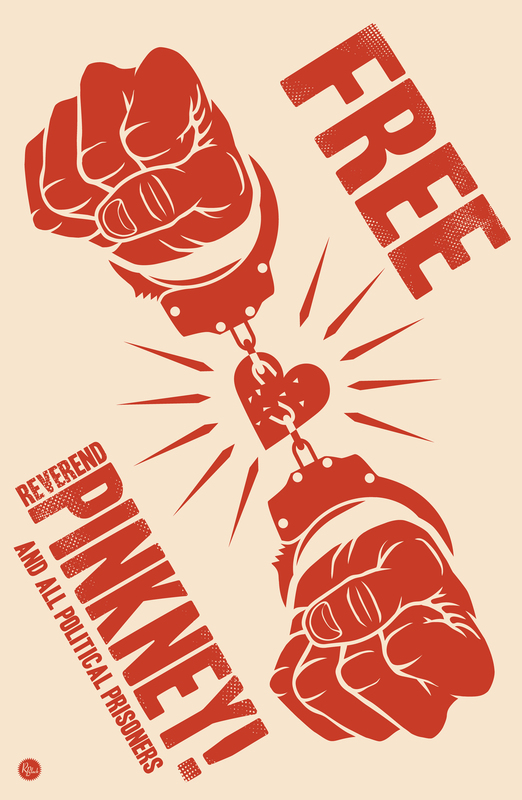 Edward Pinkney, activist church leader, then things get even more strange. Judge Alfred Butzbaugh, the racist and corrupt judge who sentenced my husband to a year in jail, stands to make a huge profit from the development of Harbor Shores. He and Judge Paul Maloney knew the only reason for the phony recall election trial and my husband’s criminal trial was to legitimize the illegal overturning of the election recalling Benton Harbor City Commissioner Glen Yarbrough. The recall couldn’t be allowed to stand, since point man Glen Yarbrough would then be gone and the whole Harbor Shores deal would fall through: the Jack Nicholas signature golf course, the fabulous multi-million dollar resort, condominiums and control of the water treatment plant. All that is included in the sweetest land grab since Manhattan Island, the complete takeover of the City of Benton Harbor by Whirlpool. Judge Butzbaugh is the president and major shareholder of a large real estate brokerage firm that owns land in a planned development. He has a partner in this business who is a member of the family that controls the largest business in town, Whirlpool, which is owned by the Upton family, led by U.S. Rep. Fred Upton, a right-wing Republican. David E. Upton is vice president and Judge Butzbaugh is president and director of the Law and Title Realty LLC, which has numerous aliases, including Ship Street Realty, Counselors Ship Street Realty in St. Joseph and Benton Harbor, the All American Group LLC and four or five others. Judges operate with greater power and independence than any other public official. When judges engage in improper conduct or abuse their authority, citizens suffer. The offending judge or corrupt judge does not. My husband, the Rev. Edward Pinkney, was charged with four felonies and a misdemeanor after a witness was pressured to say he’d been paid $5 for his vote. Rev. Pinkney was also charged with “attempting to influence absentee voters” and helping voters who couldn’t read to fill out their ballots. He never received a fair trial. The trial was riddled with corruption, before a judge who is notorious for his pro-prosecution leaning. The all-white jury was motivated by something other than the truth. Rev. Pinkney is a victim of a frame-up by Berrien County Court and Sheriff Department, which has a national reputation for police brutality and racism. On March 21, 2008, as my husband, the Rev. Edward Pinkney, sat in jail for a crime that was never committed, there was a shakedown of his cell by 10 to 20 sheriff deputies when only one deputy was needed. The sheriff of the county was there. He took legal documents, papers, briefs and notes prepared by my attorney and papers about the horrible conditions of the jail and my husband’s treatment. The sheriff violated Rev. Pinkney’s constitutional right to the First Amendment. Consequently, no matter what writing the sheriff finds in my husband’s papers and so long as they do nothing more than express his opinion about corrupt police and judges and conditions of the jail, even in terms most offensive to the judges, they are protected expressions and cannot be subject to penalty or confiscation. The Fourth Amendment protects against unreasonable seizures of persons or property. Although constitutional rights are diminished during incarceration, they are not completely abrogated. Under the First and Fourth Amendments, the sheriff has a right to look through my husband’s papers for contraband but not to read them for content. To seize some of them because of the beliefs they express, on the grounds they contain improper content, was a violation of the Fourth as well as the First Amendment. The sheriff copied the notes and delivered them to Judge Wiley, who gave them to the corrupt Judge Butzbaugh. My husband, Rev. Pinkney, had made notes on his thoughts before, during and after his hearing. These communications are privileged and either reading them or seizing them violates the Sixth Amendment attorney-client privilege and right to counsel. Under no circumstances should those papers be submitted to the court without my husband’s permission for any reason. I believe the decision to attack and harass my husband, the Rev. Edward Pinkney, came from Judge Alfred Butzbaugh to attempt to intimidate and harass him. My husband is a true warrior, a knight in every sense of the word. He is my friend and personal hero. He calls me the force on his side. I am completely, unabashedly proud of that. These days I feel like I am never doing enough, because my husband, the Rev. Edward Pinkney, has been sitting in the Berrien County Jail since December. My husband and I want people to know: YOU BETTER KEEP YOUR MIND ON YOUR FREEDOM AND FREEDOM ON YOUR MIND. You can write to my husband: Rev. 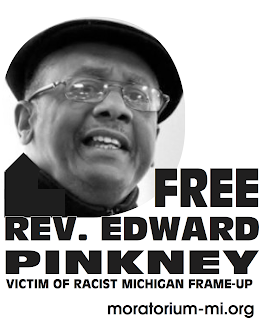 Edward Pinkney, 919 Post St., St. Joseph, MI 49085. Recently, at 3 a.m., Deputy Thompson “awoke Rev. Pinkney for the second time. He asked why the soap was placed in a certain position.” He had awakened the reverend an hour earlier to write him up for an empty potato chip bag set out for trash pickup. “Dep. T. keeps trying and failing to get Rev. P. into a fight. The People’s Tribune writes: “In a waiting room for prisoners’ families and friends at the Berrien County Jail in St. Joseph, Michigan, visitors discuss the condition of the jail – the MRSA virus and the filth. Most disgusting, families say little black worms come out of the prisoners’ shower-head, the shower drain and around the toilet. They say it’s like sewage that was never cleansed. Boycott Whirlpool and all its brands: Maytag, KitchenAid, Jenn-Air, Amana, Gladiator, GarageWorks, Inglis, Estate, Roper, Magic Chef, Acros and Supermatic in the U.S. and Bauknecht, Brastemp, Consul and Eslabon de Lujo abroad. Let Whirlpool know that’s what you’re doing: Whirlpool Corp., 2000 N. M-63, Benton Harbor, MI 49022-2692, (269) 923-5000. Make a donation for Rev. Pinkney’s Legal Defense Fund at http://bhbanco.blogspot.com or send a check payable to BANCO, 1940 Union St., Benton Harbor MI 49022. Donations are tax deductible. Demand that the governor pardon Rev. Pinkney or commute his sentence: Gov. Jennifer Granholm, P. O. Box 30013, Lansing MI 48909, (517) 335-7858. Demand an immediate investigation into this injustice: Congressional Black Caucus, 2264 Rayburn House Office Bldg, Washington DC 20515, (202) 226-9776.